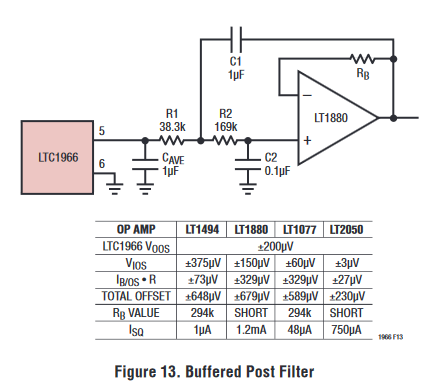 Just a quick question about an application circuit in the LTC1966 datasheet. Figure 13 on page 18 shows a third order (when considering output resistance of the LTC1966) Sallen-Key filter, with a resistor RB between the non-inverting input and the output of the op amp. What is the purpose of this resistor? It doesn't exist on any Sallen-Key schematics I can find, and the datasheet just gives us two values for their measurements - 294K and 0R, with no other information. Can anyone shed any light on the purpose of this resistor? That resistor will be unfamiliar to Sallen-Key designers, since it's usually zero, making the op amp a unity gain buffer. While it's generally useful to match impedances on the two inputs, theoretically matching the effects of input leakage current, it won't make too much difference in most designs since in a unity gain buffer the small offset will result in a similarly small offset on the output. Presumably, two of the op amps they suggested have a higher input bias current than the other two, and this input impedance matching becomes a larger issue. Not the answer you're looking for? Browse other questions tagged voltage analog measurement rms sallen-key or ask your own question.